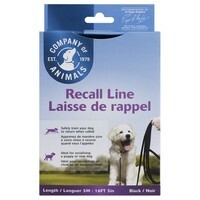 Company of Animals Recall Line Training Lead is ideal for recall training and controlled socialisation for puppies and dogs of any age. Made from very soft black padded webbing, the line is gentle for your dog and hands, and can easily be machine washed when necessary. Recommended by Dr Roger Mugford and other leading trainers, this long line also comes with a free training guide.